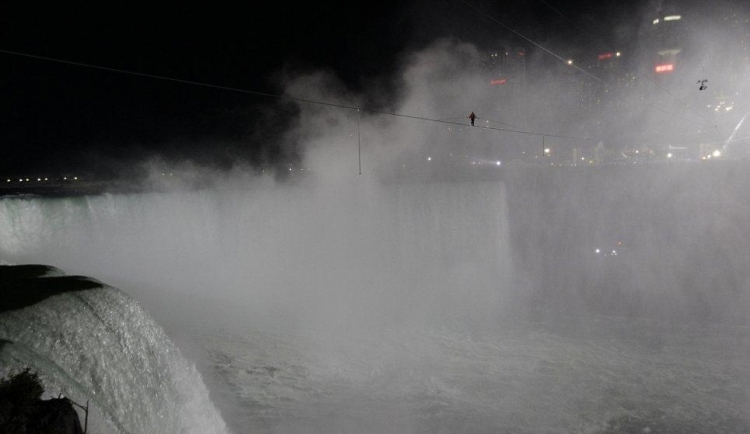 Nik Wallenda, a member of the famed "Flying Wallendas" family of aerialists, completed a historic tightrope crossing through the mist over Niagara Falls Gorge on Friday, stepping from a 2-inch wire (5 cm) onto safe ground in Canada to wild cheers from a crowd of thousands. 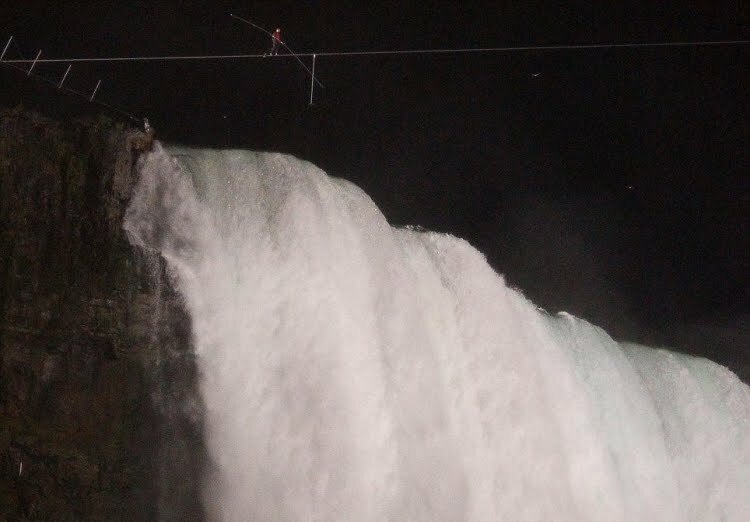 Wallenda made the walk from the U.S. side of the falls to the Canadian side, a journey of 1,800 feet (550 meters) over treacherous waters and rocks, in a little more than 25 minutes. More than a century ago, an aerialist known as the Great Blondin walked a high wire strung farther down the gorge, but a trek over the brink of the falls had never before been attempted. 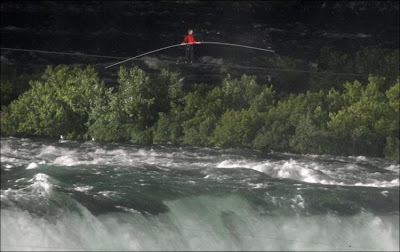 Along the way, suspended over the falls, Wallenda, 33, took small, steady steps on a slick cable through swirling winds. 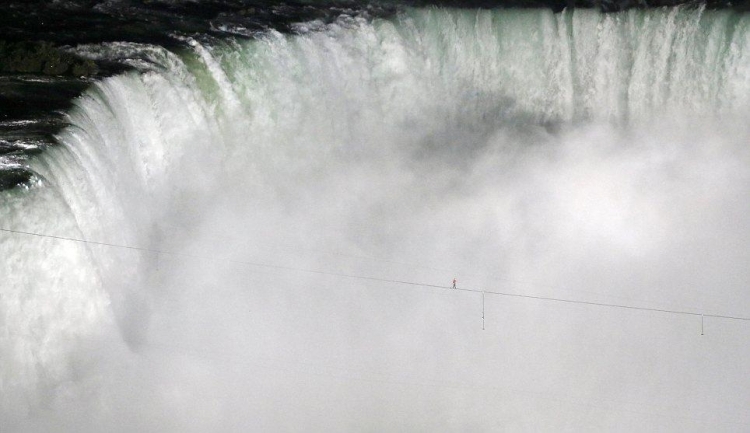 "Oh my gosh it's an unbelievable view," he said as he crossed over the falls. "This is truly breathtaking." ABC, the television network that broadcast the event with a five-second delay, occasionally interviewed him along the walk, asking him about conditions and how he was coping. "That mist was thick and it was hard to see at times," he said later in the walk, when he was asked about the greatest challenge. "Wind going one way, mist another. It was very uncomfortable for a while." The network had also insisted he wear a safety tether - a first for the performer - that would connect him to the cable should he fall, and said it would stop broadcasting if he unhooked it. 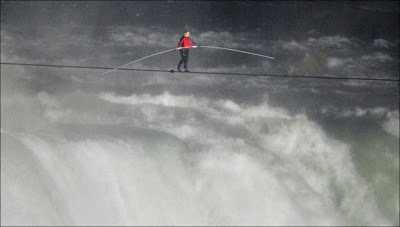 Wallenda fought the condition at first, eventually agreeing. But he gave himself an out: he would unhook only if directed to do so by his father, who designed the harness and acted as his safety coordinator. As it turned out, the tether was never tested. Wallenda walked the wire with what appeared to be perfect balance and confidence. There were 4,000 tickets that sold out in less than five minutes when they went on sale in recent weeks, and crowds began gathering early on Friday. "Hopefully it will be very peaceful and relaxing," Wallenda said beforehand. "I'm often very relaxed when I'm on the wire." He added, "There may be some tears because this is a dream of mine." 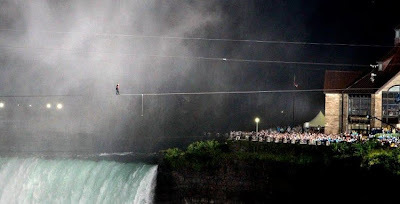 Since the Great Blondin took his high-wire walk, a ban had been in place on similar stunts over the famed falls. 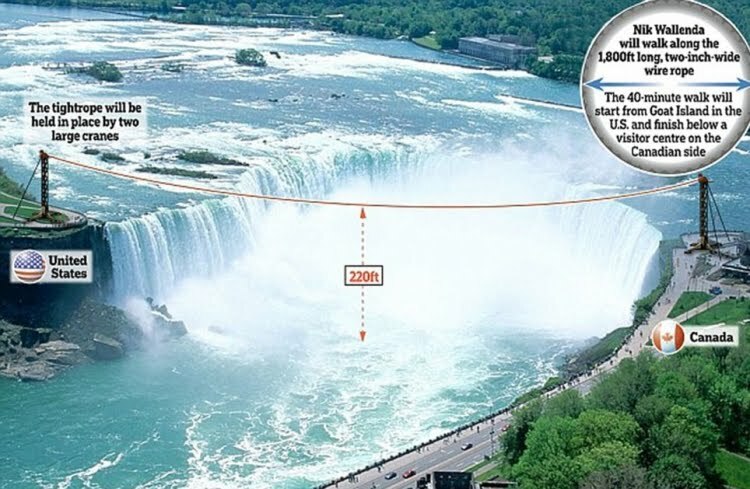 Wallenda waged a two-year crusade to convince U.S. and Canadian officials to let him try the feat. A private helicopter rescue team was part of the $1.3 million that Wallenda said he had spent on the walk. Kathy Swoffer, of Port Huron, Michigan, who had set up a lawn chair hours before the event, said she had seen the Wallendas perform years earlier in Detroit. "I think it's a person wanting to do what they do for a living and fulfilling a lifelong dream," she said. Wallenda's great-grandfather Karl Wallenda died in 1978 during a walk between two buildings in Puerto Rico at age 73. 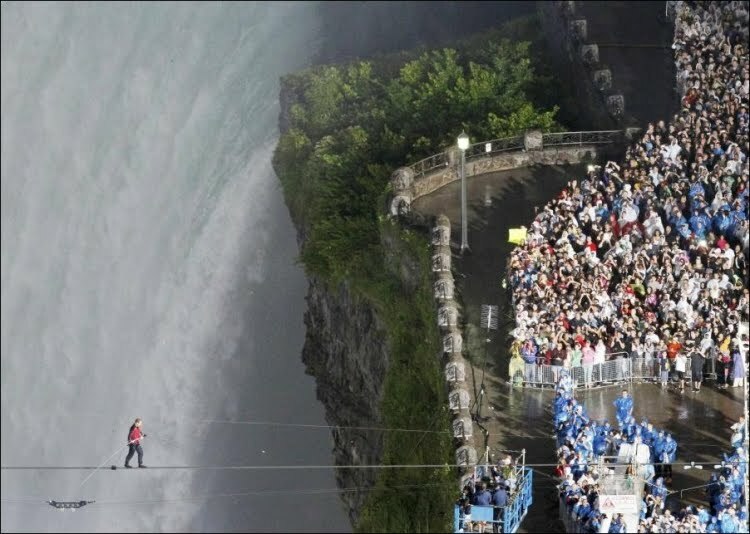 Wallenda repeated that walk last year with his mother. 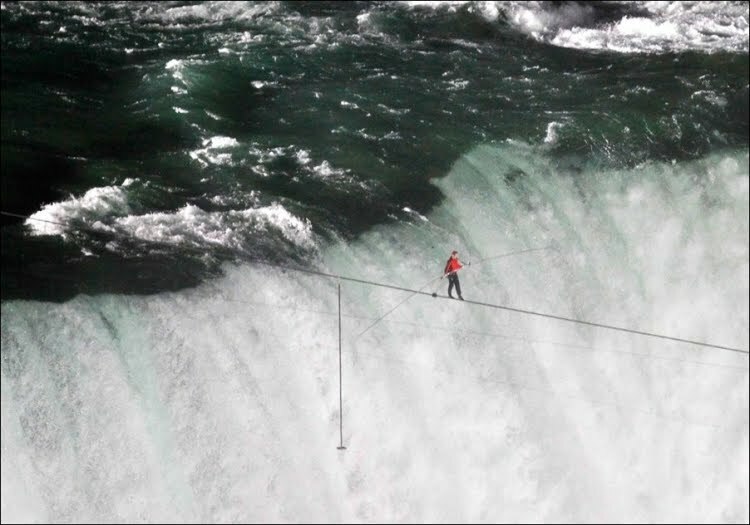 Wallenda said he had obtained permits for a future walk over the Grand Canyon in Arizona, which would be the first ever attempted and roughly three times longer than the walk over Niagara Falls. I've been browsing online greater than 3 hours nowadays, but I never found any attention-grabbing article like yours. It's beautiful value enough for me. my web page ... Search Results For "Http:Hugedds.Com"
I feel that you simply could do with a few percent to drive the message house a bit, but other than that, that is great blog. Hi! I could have sworn I've been to your blog before but after going through many of the posts I realized it's new to me. Regardless, I'm certainly delighted I found it and I'll be book-marking it and checking back often! topic that's been discussed for many years. Great stuff, just wonderful! I ultimately stumbled upon this website. Reading this info So i'm glad to show that I have a very just right uncanny feeling I came upon just what I needed. I most surely will make certain to don?t overlook this website and give it a glance regularly. Hi everyone, it's my first pay a visit at this web site, and piece of writing is in fact fruitful in favor of me, keep up posting these types of articles. My blog has a lot of exclusive content I've either authored myself or outsourced but it looks like a lot of it is popping it up all over the web without my permission. Do you know any ways to help reduce content from being ripped off? I'd definitely appreciate it. may not be a taboo subject but usually people don't discuss such issues. To the next! Best wishes!! Fine way of explaining, and fastidious piece of writing to take data concerning my presentation topic, which i am going to deliver in university. hey there and thank you for your information – I've definitely picked up anything new from right here. I did however expertise some technical points using this web site, as I experienced to reload the site lots of times previous to I could get it to load correctly. I had been wondering if your hosting is OK? Not that I am complaining, but slow loading instances times will very frequently affect your placement in google and can damage your quality score if advertising and marketing with Adwords. Well I'm adding this RSS to my e-mail and could look out for much more of your respective exciting content. Hi everyone, it's my first go to see at this web page, and article is genuinely fruitful designed for me, keep up posting these articles or reviews. I am not positive whether this post is written by means of him as nobody else understand such detailed about my difficulty. The clarity for your post is just nice and that i could assume you're knowledgeable on this subject. 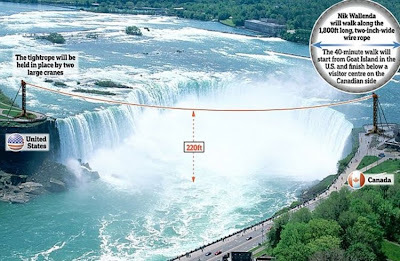 Fine with your permission let me to grasp your RSS feed to keep up to date with coming near near post. Thanks one million and please continue the gratifying work. 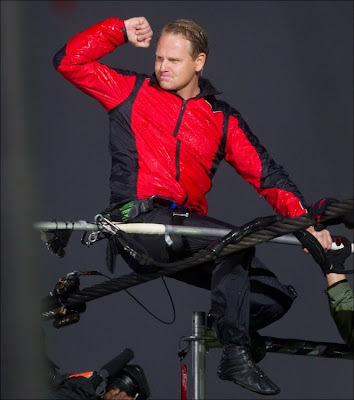 A private helicopter rescue team was part of the $1.3 million that Wallenda said he had spent on the walk. What's up, nice online site you possess there.